On the other side of the world, across from Europe, New Zealand’s North and South Islands cover a length of 1600 kilometers. 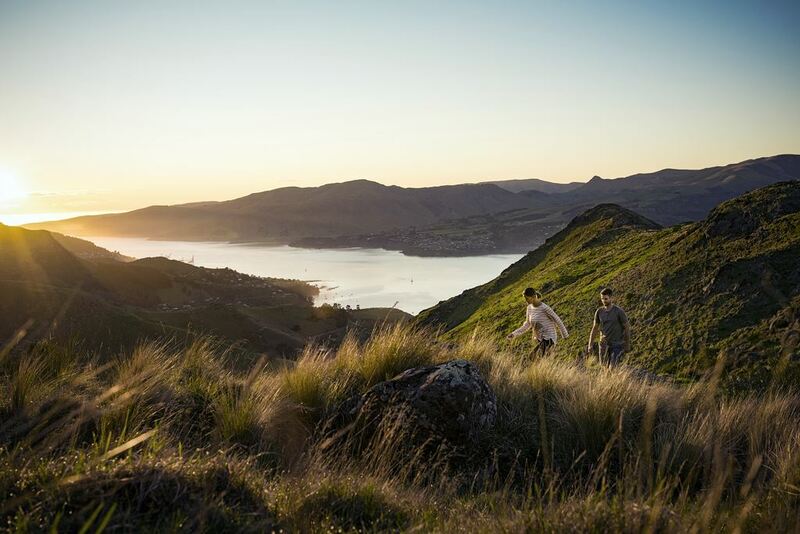 Among nature lovers, New Zealand is considered one of the last adventure tour areas which has largely been spared from mass tourism. 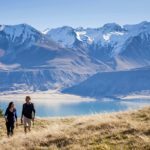 Endless beaches, fjords, fern forests and geysers, the magnificent alpine landscape of the Southern Alps and the endless pastures open up a variety of unique opportunities for nature lovers. Hardly any other part of our world offers so many different landscapes in a relatively small space. The spectacular landscapes and the very diverse flora and fauna are the focus of this trip. The natural beauty of the Fjordland National Park is one of the most impressive experiences of this tour. A boat trip on the Milford Sound will surely remain unforgettable. We cordially invite you to join us on the other side of the world. “Haere Mai” welcome to New Zealand! Welcome to New Zealand!After picking up your rental car at the airport, you will drive to your first accommodation. On the way, you will drive through the “City of Sails”, as Auckland is also called. You can still go today to the extinct Mt. Eden volcano, from where you can enjoy a magnificent view over the city. Or go to the elegant suburb “Parnell” and the port of Auckland. 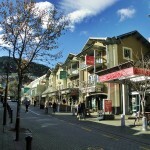 Afterwards, you can either stroll along the harbor or stroll through the shopping centers of the city center. 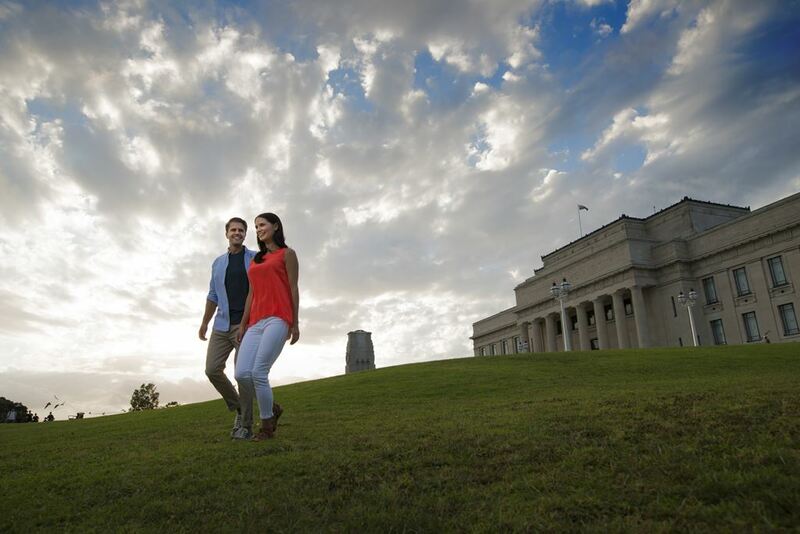 Also a visit to the War Memorial Museum or the Sky City Tower is recommended.We recommend dinner in the Brazilian “Wildfire” restaurant. This restaurant, located at the harbor, offers you a special culinary experience. 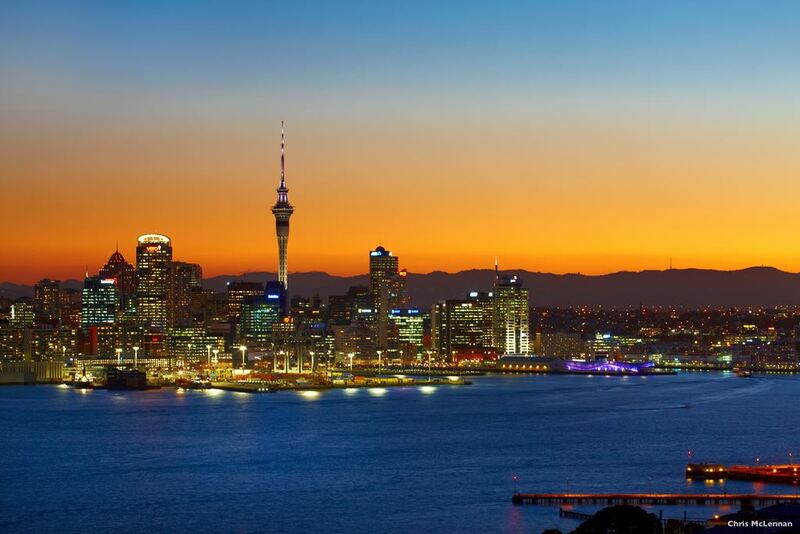 If you prefer a dinner with spectacular panoramic views to the largest city in New Zealand, we recommend visiting the rotating Orbit Restaurant at the Sky Tower (all activities optional). In the early morning you leave the city of Auckland and drive over the harbor bridge along the Hibiscus coast to Matakohe where you can visit the popular Kauri and Pioneer Museum (optional). In the afternoon you will reach the Waipoua Kauri Forest, where the gigantic Kauri trees can be found alongside the typical fern trees. These are not only among the most powerful conifers on earth, but also among the oldest in nature. After walking through the forest you will continue through Opononi to the natural harbor Hokianga. The strong west wind regularly leaves large sand masses, which rise at the entrance of Hokianga Harbor to imposing dunes. Continue your journey to Paihia in the Bay of Islands. Design your day to your liking. You can take a trip along the “Ninety Mile Beach” to Cape Reinga, the tip of the North Island. Or take a boat trip through the island world of the Bay of Islands, New Zealand’s subtropical paradise. An interesting historical excursion is the visit to the Treaty House of Waitangi, where the peace treaty between Maoris and English was signed in 1840 and which still has great significance in the coexistence of both cultures. We recommend the “Dolphin Eco Experience”. This tour gives you the opportunity to swim and snorkel with dolphins in their natural environment. If you are lucky, you’ll meet bottlenose dolphins, other dolphins, baleen whales, orcas, seals, fish and penguins. 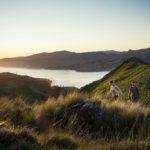 You can also drive to some remote islands and gain an insight into this historically significant region of New Zealand (all activities are optional). From Whangarei and Auckland, you will enter the fertile heart of the North Island with its distinctive dairy farming before reaching Waitomo / Waikato district. Nearby you have the opportunity to visit the famous Waitomo glowworm caves (optional). In a boat, you glide on the underground lake through the glowworm cave. Alternatively, you can make it a bit more adventurous. Equipped with a neoprene suit, helmet and headlight, you float together in a tire through the glowworm caves. As soon as the lights are extinguished, the cave ceiling illuminates with 1000s of small lights just like the Milky Way. You will spend the evening in a rural area. Together with your New Zealand hosts, you can enjoy a delicious dinner. After breakfast, you say goodbye to your hosts. On your way to Whakatane we recommend an intermediate stop in Matamata (optional). In a two-hour guided tour, you will discover the true center of the world and visit the “Lord of the Rings” film set and the “Hobbit” trilogies, which might be better known to you as “Auenland”. During your tour you will see the Hobbit caves, the “The Green Dragon Inn” and many other highlights.The drive will take you to the “Avocado City” Katikati and the harbor town of Tauranga in the Bay of Plenty, the main Kiwifruit area. Finally, you arrive at your destination Whakatane, where you will see the island of White Island, an extremely active volcano under a constant smoke cloud, from the sea. The city of Maori is characterized by its beautiful harbor directly by the sea. This day is at your own leisure to relax on the beach, or you can go on a very special tour to White Island which adventure boat enthusiasts and geologists should not miss. Captain Cook gave his name to this most active of all volcanic islands. You drive for about 1½ hours by boat and then, under expert guidance, explore the island to the bubbling, stinking crater rim – equipped with helmet and gas mask! If this seems too daring or time-consuming, the island can also be viewed from the air. From where you will be able to take some fantastic photos! (all activities optional). Today you leave Whakatane and travel past the city of Rotorua distinguished through its volcanic activity and sulphur smell. Here you have the choice between many local attractions. 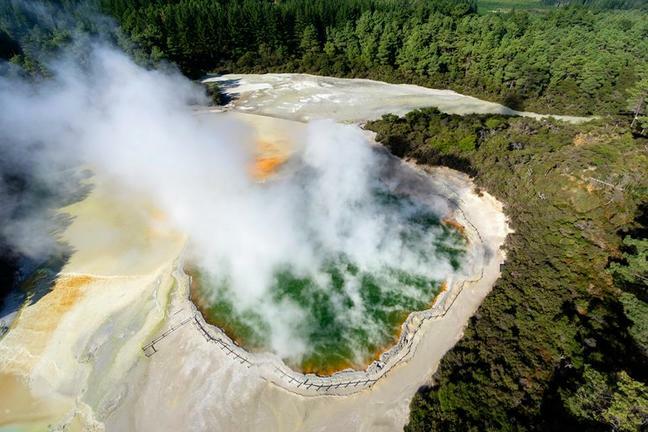 We recommend visiting Orakei Karako or Wai-O-Tapu Thermal Wonderland (all activities optional): • Orakei Karako: Experience a world of bubbling geysers, hot springs, mudholes and sintered terraces. Hike through the “Hidden Valley” and visit the thermal “Ruatapu Cave” where the “Pool of Mirrors” lies. Nowhere else can you find so many active geysers. 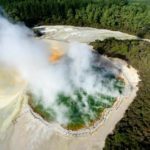 Orakei Karako was described by the Lonely Planet as the best thermal area in New Zealand.• Wai-O-Tapu Thermal Wonderland: Visit the Wai-O-Tapu Thermal Wonderland, known for boiling mud pools, white sintered terraces, geysers and seething lakes. With its “Painter’s Palette, Devil’s Ink Pen and Champagne Pool”, it is the most colorful of the thermal areas. The main attraction is Lady Knox Geysir, which breaks up to 20 meters high every morning (10:15 am). Such a geyser occurs where superheated deep water penetrates into a groundwater reservoir, heats it and partially boils. As a result, steam flashes upwards in meter-high water fountains. 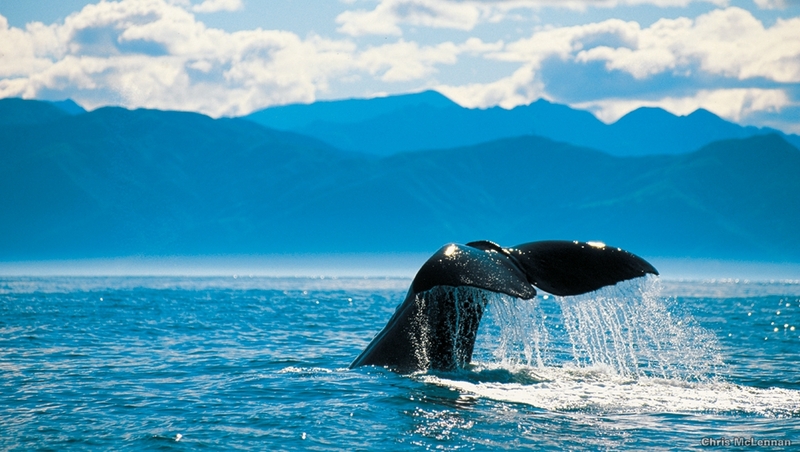 Continue your journey to Lake Taupo, the largest lake in New Zealand. On the way we recommend the visit of the Huka waterfalls, where the mighty Waikato river is forced through a tight gorge. You travel to Lake Taupo. The Lake Taupo is a crater lake larger than Lake Constance, which was created about 2000 years ago by a massive volcanic eruption. (Noted by residents of Greece and Rome whoo notices a dark hue to the sky. Taupo is a popular holiday destination for New Zealanders and offers many activities on water, on land and in the air. The three still active volcanoes of the Tongariro National Park form the backdrop of your trip along the Desert Road. The journey past peaks of up to 2700 m, takes you to the green, fertile farmlands of Rangitikei and Manawatu. The journey continues along the Kapiti coast to Wellington, the capital of New Zealand.Here you can visit the Parliament, stroll along the promenade, or explore the National Museum “Te Papa” (free admission). 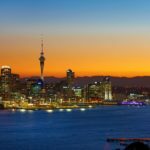 The cable car will take you to the observatory, botanical garden and viewpoint over the harbor, while you can enjoy panoramic views of the capital of New Zealand from Mount Victoria. In the evening, we recommend visiting Zealandia. With a local guide, you will take a small hike through the park and see different animals, which are active in the evening hours. With a little luck, you can even see the kiwi bird, an endangered nocturnal bird, and at the same time the national symbol of New Zealand (all activities optional). You travel back to Picton by boat. You then continue along the east coast southwards. You will first reach Blenheim in the Marlborough Plain. Vineyards in this region began in the 1970s, when “Montana Wines” looked for new land. The composition of the earth, high sunshine, a long autumn and cold winter, are excellent prerequisites for a first-class wine, especially Sauvignon Blanc.Continue your trip along the wild-romantic coast to Kaikoura. Here sperm whales are regular visitors, attracted by the rich food supply in the warm sea currents. You can also watch fur seals lying along the highways on the rocks, and with some luck you might even see some dolphins jumping acrobatically out of the water. 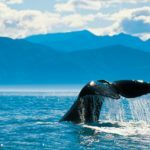 In the morning you have the opportunity to participate in a whale watching tour (optional). 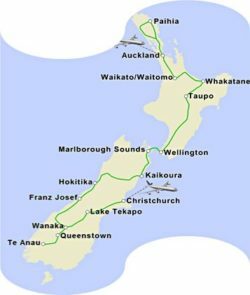 Afterwards, you will continue your journey inland, along some remote forest roads and over the Alpine-covered Lewis Pass and the dense southern beech forests to the west coast. You pass through the harbour town of Greymouth and a landscape, characterized by agriculture and forestry, as well as historical Goldmining areas. Then you will arrive at your destination Hokitika, at the mouth of the river of the same name. The city is the centre of the processing of the greenstone, the very hard, New Zealand jade, which can be transformed into beautiful jewellery. In the morning, we recommend you participate in the “Arahura Greenstone Tour” (optional). You will go on a guided tour along the Arahura River in search of the green jade. 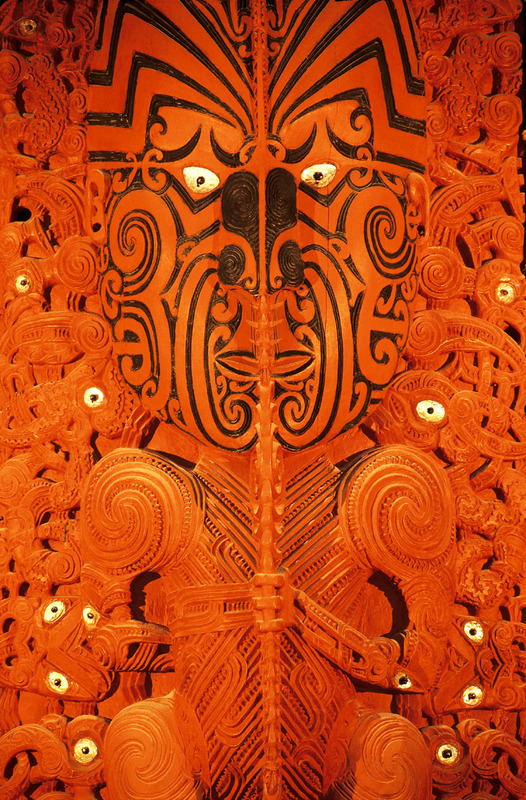 Your Maori Guide will tell you the legends and stories of his people (Kati Wae Wae Hapu). 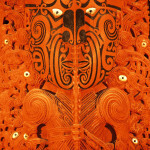 In addition, you will learn the importance of the greenstone for Maori. On your hike, you will find your stone which you will make into jewellery and can take as a souvenir of your time in New Zealand. The tour takes about 2 hours.You then continue your journey to Ross, a forgotten old gold mining village. Ross is said to be worth 700 million dollars in the form of gold. One more reason that this area attracts numerous adventurers again. Then you continue to the glacier region of the Southern Alps, whose highest peak south of Hokitika abruptly rises to a height of 3500m. As a natural weather barrier, the mountain range is responsible for the extreme rainfall in this area. Above the snow line large ice masses accumulate, forming fast-flowing valley glaciers. The Franz Josef Glacier and the Fox Glacier slide down to a height of 300 m above sea level – unique in these moderate latitudes. Today, close to the village of Fox Glacier, you can take a morning walk to Lake Matheson (optional). This lake is also known as “Mirror lake”, as, in fine weather, the highest mountain in New Zealand, the Mount Cook, is reflected in its waters.The journey continues through the Westland National Park, which has declared a “world heritage site”. 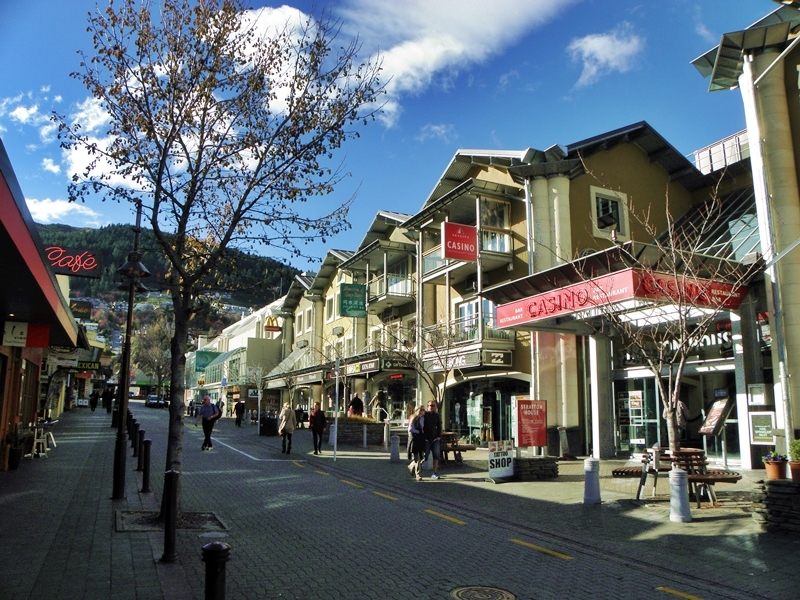 Cross the Haast Pass, the southern part of the southern Alps, past the high mountains of Aspiring National Park and the deep glacier lakes Wanaka and Hawea, you will reach the beautifully situated resort of Wanaka. You travel over the resort town Queenstown onto Te Anau, the gateway to the Fjordland National Park, New Zealand’s largest national park. Hardly a landscape embodies the concept of wilderness as the Fjordland. In the west, 14 fjords penetrate deep into the jungles of a rugged Alpine world and snowy mountain peaks rise up over alpine grass. 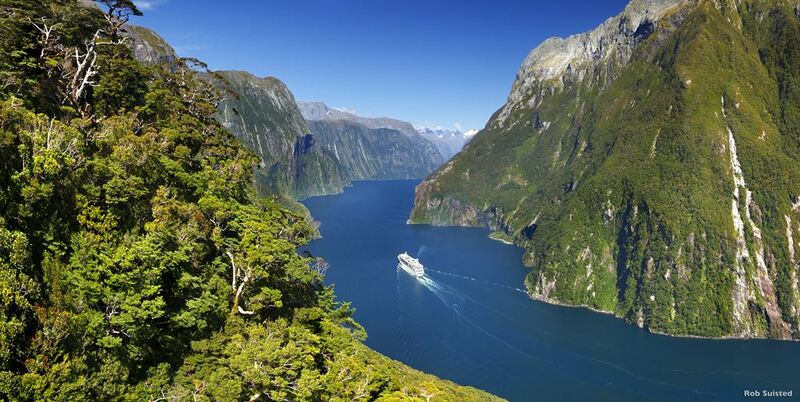 Today you have the opportunity to take a trip to the famous Milford Sound. The Milford Sound is the most developed of the fjords and has been called eighth world wonder. Drive along the spectacular Milford Road. At the Homer Tunnel you often see the naughty Keas, the only mountain parrots in the world. Once you arrive at Milford, you will board an excursion boat which takes you on a trip along the Milford Sound. The ship follows the course of the fjord and glides out to the Tasman Sea. Enjoy the wild-romantic scenery, which is determined by almost vertical mountain walls. 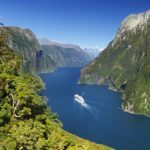 Alternatively, an excursion on the less developed Doubtful Sound is possible (all activities optional).Then continue to Queenstown, often referred to as “St Moritz the South Seas”. Due to its beautiful mountain location on the shores of Lake Wakatipu, the small resort has become the popular tourist center of the South Island. 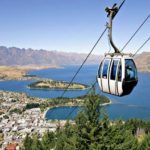 Today is at your leisure and in Queenstown, the adventure city of New Zealand, there is much to experience and to discover. Take a trip on the steamship “TSS Earnslaw” and cross Lake Wakatipu to Walter Peak Station. Here you can also have a grilled lunch and can participate in a farm tour. Alternatively, you can explore Queenstown’s wild backcountry by jeep, with an experienced off-road driver. Learn about the gold rush in this area as you ride over the rough and magnificent terrain of Skippers Canyon, the Grand Canyon of New Zealand. 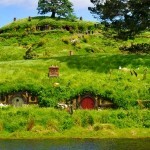 Also Lord of the Rings tours to the scenes of filming are offered. Other recommended activities: Skyline Gondola, Shotover Jet and Dart River Safari (all activities optional). From Lake Wakatipu, continue your journey across the Lindis Pass (971 m) through McKenzie Country. 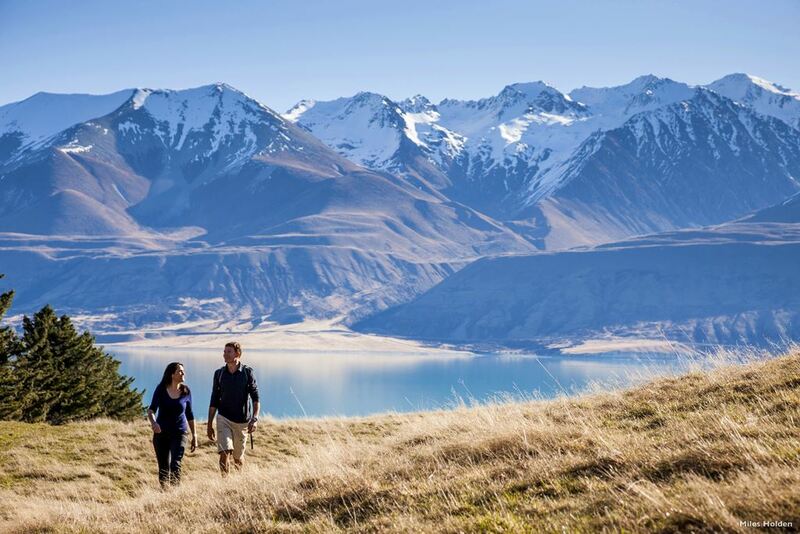 At Lake Pukaki you have the opportunity to admire, in good weather, the magnificent glacier world of Mount Cook. The Maori call this mountain “Aoraki”, the “cloud breaker”.Continue to Lake Tekapo where you will find the “Church of the Good Shepherd” (Church of the Good Shepherd), which since about 1930 has defied the arid, hard climate of this area. Built with local materials, it is intended to symbolize durability and strength. Particularly impressive is the picturesque view from the window behind the altar. There you can admire the intensely turquoise lake and the surrounding alpine mountains. In the evening we recommend the “Earth & Sky Observatory Tour” (optional), where you will get to know the wonders of the southern stars. Today, you will leave the three-thousand-plus peaks of the Southern Alps and experience a spectacular vegetation change again. The journey continues through Canterbury, the fertile heart of the South Island, where extensive farmland stretches as a patchwork carpet. The final destination is Christchurch, the largest city on the South Island.Here you can take a walk through the beautiful botanical gardens and visit the Art Gallery. In the evening we recommend the “Tram Dinner”. Here you may dine in the restored historical tram, in an air-conditioned tramcar, while you are on a sightseeing tour (all activities are optional). Please drive to Christchurch airport in good time and leave your rental car here. From here you start your journey home. We wish you a good flight! All services described in the tour program are subject to hotel, activity and transfer fees.